For anyone who doesn’t know, the WebSummit is an annual tech conference held in Dublin Ireland. For three days in November Tech junkies, Media personnel, Startups, Tech Giants, Founders and even School kids all descend on the RDS to learn from the best, secure investment or land that perfect job. It truly is a geek’s networking heaven. Apart from WiFi issues and long queues, this year’s WebSummit was a huge success. Tipping over 22,000 attendees this year, its biggest yet, the WebSummit has gone from strength to strength since starting out as a 500 person meet up for the local technology community. Before the WebSummit, which we attended and thoroughly enjoyed, we decided that, along with countless other analytics companies, we would put together a blog post on data gathered from Twitter over the course of the 3 or 4 days. Using Twitter’s Streaming API we collected about 77,300 Tweets in total from 10am Nov 3 to 10am Nov 7 (times in GMT). We set it to monitor the hashtags and users mentioned above. Once we had gathered the Tweets, we used AYLIEN Text Analysis API from within RapidMiner to Analyze the Sentiment of the Tweets. Following the analysis, we visualized the data in Tableau. 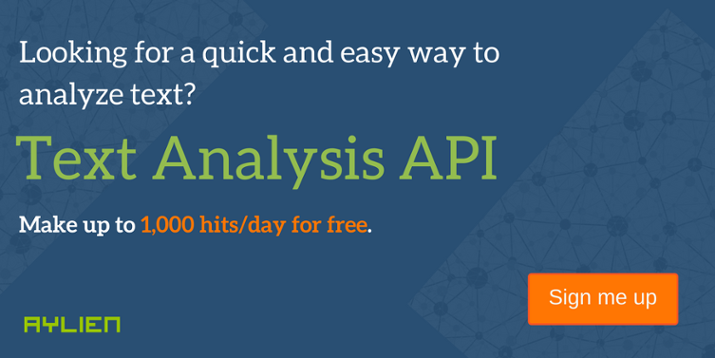 You can read more about RapidMiner and AYLIEN Text Analysis API here. While the activity was quite constant over three days you can see three major spikes in the volume of Tweets which represent each day. It’s pretty clear from this that people were enjoying themselves too much at the Night Summit to be Tweeting from the pub with the drop in volume as the day progressed. There was also a pretty evident dip in activity during lunch which suggests we all enjoyed the food or the networking opportunities the lunch break provided. The second graph below shows the volume of tweets with a mention of one of the speakers we were monitoring. You can clearly see spikes in volume when they hit the stage to speak. Tweets mentioning Paddy Cosgrave, WebSummit’s founder stayed pretty constant throughout. Surprisingly, the most talked about speaker at this technology conference wasn’t the founder of Dropbox or even Peter Thiel, it was Eva Longoria, the star of Desperate Housewives! Bono came in second and Peter Thiel was the third most mentioned speaker. It turns out even tech geeks have a thing for celebrities. We utilized the location data returned via the Twitter API to map where most of the activity was coming from. Not suprisingly, chatter was mainly concentrated in Dublin. What was surprising is how little activity was coming from the US. Tweets from and about the Summit were predominantly written in English. Considering there were companies and attendees from all over the world we expected more multi-lingual data and were surprised by the lack of Tweets in other languages. We hoped to get a feel for people’s reactions to the event by mining and analyzing the voice of attendees through their expressions and activity on Twitter. Overall the sentiment of the event was quite positive, however there were some negative trends that creep in throughout the event. People were most vocal about the lack of a good connection and the queues for the food. We analyzed all the positive and negative Tweets and created a word cloud for each by extracting keywords mentioned in those tweets. This gave a pretty clear understanding for what people liked and disliked about the event. Note: you can hover over the circles in the word clouds to see any words that aren’t displayed. Some words and terms were evident in both positive and negative Tweets. The jury was out on Eva Longoria’s attendance and it’s pretty obvious the public is still undecided on what they make of Bono. Considering it was a tech event you would presume connectivity would be a given. That wasn’t the case. There was a strong reaction to the lack of a WiFi signal. At an event that gets 20,000+ tech heads into one room, each with a minimum of 2 devices, ensuring the ability to stay connected was always going to be a challenge. The initial reaction to the WiFi issues was evident in the sharp drop in polarity of Tweets. Each day it certainly had an effect on the overall sentiment of the event. However, at the close of the event the polarity had returned to where it started as people wrapped their WebSummit experience up in mostly positive Tweets. Perhaps the lack of connectivity also meant that a lot of the attendees didn’t even get the option to vent their frustrations online. We really enjoyed our time at the Summit, met some great people and companies and learned a lot from some of the excellent speakers. Looking forward to next year’s Summit already!